The District & Sessions Court of Silchar gets a facelift. The walls of the court premises have been painted with a unique theme by a team of 65 artists in the past two days. 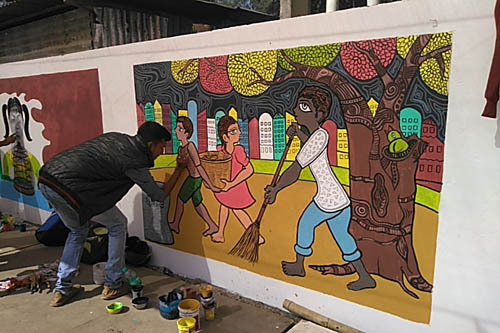 Under the aegis of District Legal Services Authority in collaboration with District Judiciary, a team of 65 artists from 15 art schools, came up with this unique idea to paint the walls of the court’s premises. Aptly supported by Department of Fine Arts, Assam University, these artists painted the father of the nation, Mahatma Gandhi’s Dandi march, Gandhi visiting Silchar in 1921, illustrations of Bhim Rao Ambedkar, who drafted the constitution of our country. The walls were also filled up with paintings of a court proceeding to historical monuments like Guwahati High Court and the Supreme Court. Juvenile justice, child abuse and child labour, and especially, swaach bharat abhiyan issues too have been painted with finesse. Judge, Darek Ullah, added, “Any damage or littering of this premise henceforth would be a punishable offence. We would evict anyone who sets up something in front of these walls and shall impose fines too for any violation of these rules.